Morning instruction was very clear to us. It is going to be the toughest day for us. We have to cover a distance of nearly 15 KM. 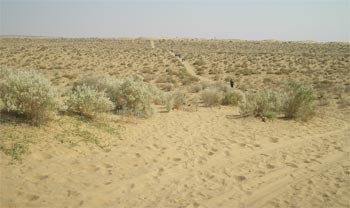 Our plan was to cover maximum distance before the lunch as it will be comfortable till that time and after 12 PM till 4 PM desert became hot and walking became little difficult with hot sand and sun. Every day we start our trekking from the camp for the next camp at 8 AM. Before leaving the camp we fill our water bottles and drink some water. On the camel our guide carries 40 liters of water for all of us of around 60 trekkers. We were carrying our own water bottle with one liter of water. The instructions were very clear; there is enough water to drink but not a single drop of water to waste. Out of 5 days inside desert two days we had managed by drinking hard water. The villagers of that area were drinking that water since their birth. Usually after entering to a new camp in the evening the first question we ask each other is how the drinking water is. Desert has its own way to keep the drinking water cool. Pots with water kept below the bushes half merged inside sand. The sand around the pot kept wet by sprinkling water on it. Without electricity or refrigerator this a unique way to keep the water cools. For some 4 to 5 KM we were walking on the road. There were some small sand dunes; in the local language the small sand dunes are called Tilla. We took a right turn and left the road. Now it was an open land to walk. Every one was walking on there own way as there was no fixed path. The guide told us the direction to follow. We were moving with an eye on the camel of our guide. That is the most important point here. Usually the camel because of its connected cart it was taking a curved path and we were walking on straight lines. From a distance of 1 KM also the camel was visible so we were moving along with it. 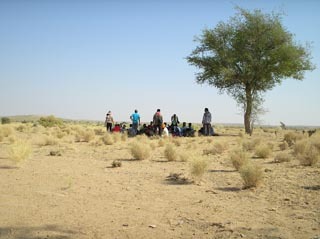 Once lost means survival became difficult as there was no village or any water point within 25 KM radius area. After moving some 5 KMs our guide directed us towards three big trees standing close to each other as our lunch point. But the trees were at a distance of 3 KMs, and finally we were there at 12 noon. Time for lunch break and rest. Three trees were just enough to give us shade for the lunch for the group of 60 of us. Even tough the temperature was raising, below the tree it was cool. Here we first encountered the desert thorn, already many were there in out paints and shirts. These thorns are to be removed carefully; they pinch the fingers while removing. After short lunch break we started our journey. Found skeletons of some small desert animals and birds. Suddenly some people started shouting DEER, DEER. That's all , no deer was found. Only few got a chance to see the deer, one has to maintain absolute silent and should able to indicate about the presence of any animal. From this point onwards we came across many deer, fox and peacocks particularly during our last three days of the trek. To spot a deer one has to move little away from the group and keep an eye on left and right. Usually the deer runs away as soon as it sees a group or some one is approaching them. So maintaining absolute silence is a must to spot these small animals. These animals come to the nearest water point of the villages early in the morning and evening. Peacocks move freely around the villages inside the desert. Finally we reached Hattar camp around 2 PM. 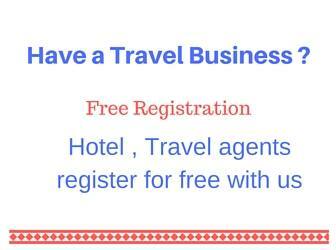 Now rest and relax for some time. Time for some cricket also as Bat and ball was available in the camp. Hattar village was close to our camp and we found many deer moving around. 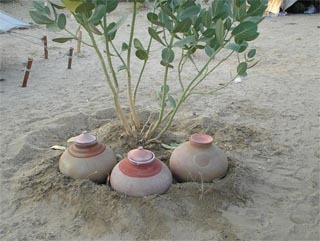 In some places near villages water harvesting system is developed to store rain water. In a ground at the lowest point wells constructed, with top covered and side opening to allow rain water to enter. The water entry points are closed with stones in dry seasons. At the top a covered window is provided to take out water. Next day camp was at Dhaneli village.